Thursday, 8 May 2014; One Year and Thirty Seven Days Old. 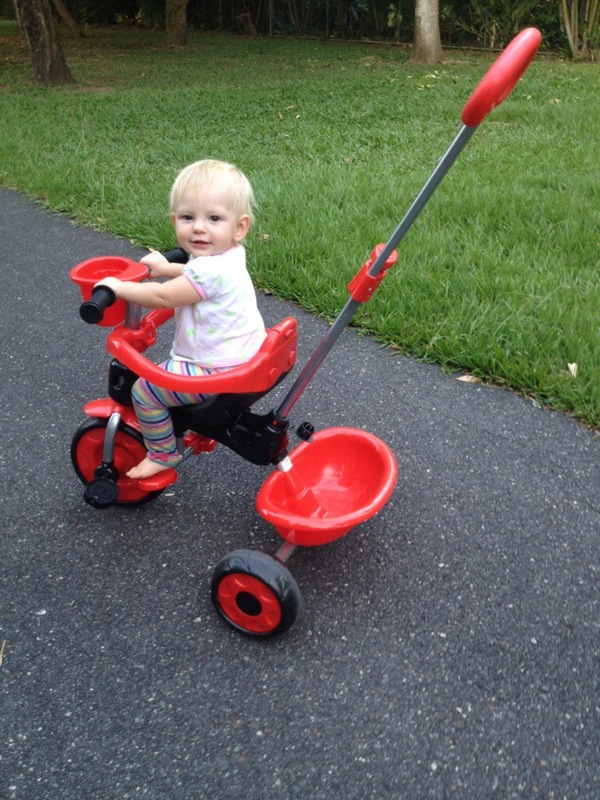 Ayla loves her little trike that she got for her birthday. Now that Ayla is a little but older, a little bit more mobile and a lot more communicative, it’s becoming far easier to tell what she likes and doesn’t like. And Ayla likes her trike. She also like animals and being outdoors, and of course Ayla loves adventuring so it was no surprise this afternoon when Ayla “asked” to go for a trike ride. Ayla made her wishes known by pointing at the trike, crawling over to it and bashing on the seat, then crying angrily when I walked away to get my shoes. We set off in the hope of meeting Hubby on his way home from work, but instead Ayla and I got stuck in the park and spent ages looking for birds and watching the trees sway in the breeze. We got home half an hour later to find Hubby’s car in the driveway; Ayla shrieked “dada” at the top of her lungs and started kicking the sides of the trike to make it go faster, but I wasn’t up to running. So instead Ayla managed to climb her way to standing on the seat with her hands on the handlebars, leaning forward like a daredevil while I pushed her along. Crazy kid.